In the first of a pair of board books by Harriet Ziefert, illus. 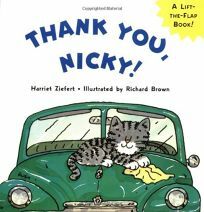 by Richard Brown, Where's Nicky's Valentine?, the titular feline delivers cards to neighborhood friends; addressees appear behind flaps. Thank You, Nicky! follows the courteous cat as he goes for a stroll and helps his neighbors along the way.